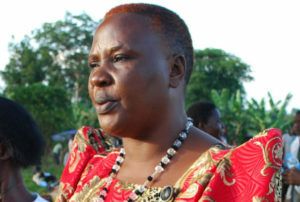 Robinah Ssentongo won the Kyotera District Women MP seat. Courtesy photo. Robinah Ssentongo, the Democratic Party candidate, won the Woman parliamentary seat in elections conducted yesterday in the newly-created Kyotera district. 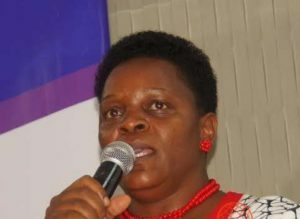 Ssentongo polled 21,731 votes, beating her main rival Rachael Nakitende of NRM who polled 15,511 votes. The results were announced yesterday evening by Leticia Nantabo, the returning officer of greater Masaka region. But the district chairmanship seat was taken by NRM’s Patrick Kintu Kisekulo who garnered 19,481 votes defeating DP’s Tom Darlington, who garnered only 10,080 votes. At the tally centre when Nantabo was declaring results, only Kisekulo and Ssentongo were present. Kyotera district is among the five new districts that became operational in July this year. Peace Mutuuzo of NRM won the Bunyangabu Women MP seat. Courtesy photo. Some analysts argue that the divisions within the NRM party cost it the woman parliamentary seat. The deployment of Moses Kigongo (the vice chairman of the party) and Justine Lumumba (party secretary general), among others could only help to capture the chairmanship seat. In the other districts, NRM party swept the two political positions. In Bunyangabu district, James Ategeka took the chairmanship while Peace Mutuuzo won the Woman Parliamentary seat. In Rukiga district, Alex Kampihako and Caroline Kamusiime defeated their opponents, while in Namisindwa district, George Opus and Grace Watua Namuhura are celebrating victory. For Pakwach district, Robert Omito and Jane Abur took the day. 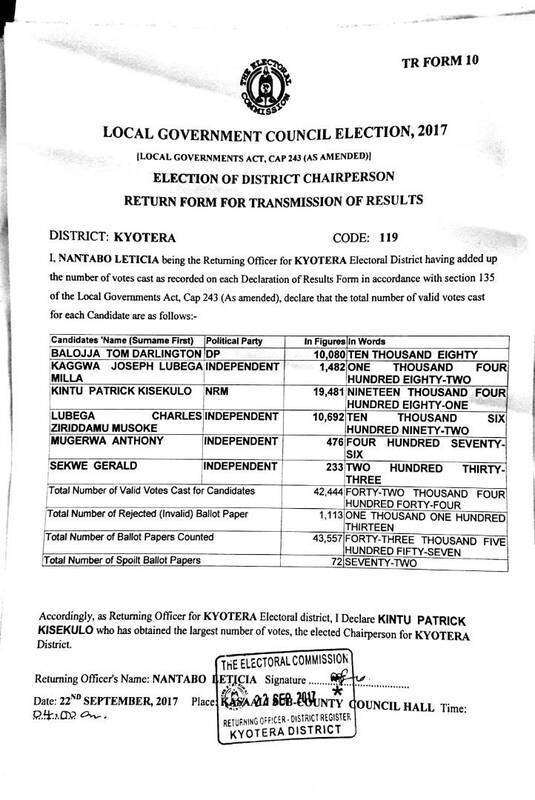 EC results for the Kyotera district LC5 seat.